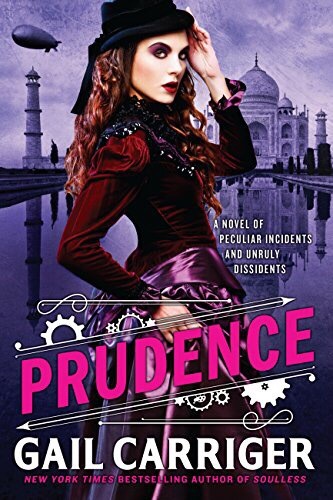 I have read Gail Carriger’s Parasol Protecterate series and listened to her Etiquette and Espionage series, so when Prudence came out, the first in the Custard Protocol series, I immediately put it on my TBR list. Yep, it took me a year and a half, the impetus being that the second book in this series, Imprudence, is out. I do love being able to quickly move on to the second book! So, I checked out an audio copy and started listening to it. A quick note about Moira Quirk, who reads Prudence on the audible book, and also did the voiceover for Etiquette and Espionage. She does a wonderful job. This series, as well as Etiquette, does not just have one or two characters. She does different voices for 10-15 characters, and does such an amazing job, even with the male voices, that you forget that it is one person reading these characters. Some characters in previous series show up and she uses the same voice for their characters, which makes them immediately recognizable. Moira Quirk is a talent! She also injects just the right amount of humor into her inflections. Truly, if she is reading this series, I will probably choose to listen to it rather than reading it, she is that enjoyable. Now for the review for Prudence. Gail Carriger has created a world that is unlike any other writer. Her characters dress in Victorian steampunk style, travel in dirigibles, fight paranormal battles, while still adhering to social niceties and rules. Yes, tea is promptly at 4 o’clock with biscuits and such, and the correct etiquette is used while raising that teacup and dodging arrows simultaneously. Seriously, I don’t mean to make light of this novel at all. The style of the characters meld completely with the storyline, that it all seems completely believable, in a rather fantastic way. Prue and her crew, travel to India on what they thought was a journey on behalf of Prue’s adopted father, on a tea trade mission, but it is in fact a mission of a different nature. It is her first undercover spy mission, and she shows a natural inclination to figuring out the mystery, and pacifying all parties involved, all while remaining very ladylike. Or as ladylike as you can be when you are a preternatural being who with a touch turns into the paranormal being you’ve touched. If you have never read a book by Gail Carriger, I would start with the book Soulless in the Parasol Protectorate series, which is about Prudence’s birth mother and father and really sets the stage for this world, and everyone in it. If you like Paranormal, then you will love these books, and Prudence, was also very enjoyable…Indeed!